established a Nurses Journal Club. Organized nursing section at International Congress of Charities, Corrections and Philanthropy, World Columbian Exposition in Chicago. This group birthed the Society of Superintendents of Training Schools, the first nursing organization, (now the NLN). Married Dr. Hunter Robb, 1894 in London, carrying a bouquet sent by Florence Nightingale. One of instigators of formation of Hospital Economics Course at Teachers College. First president of Nurses Associated Alumnae of the United States and Canada, (now ANA), 1897. One of founders of American Journal of Nursing Company. President of Association of Superintendents of Training Schools (now NLN), 1908. One of organizers of International Congress of Nurses in 1899, Chaired Committee on International Standards of Education. 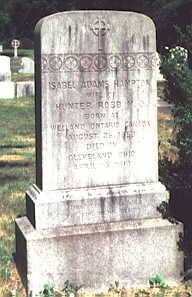 Died 4/15/1910 in Cleveland after being hit by trolley; in addition to her husband she is survived by two sons. Bullough, V.L., Church, O.M., & Stein, A.P. (Eds.). (1988). American nursing: A biographical dictionary. New York: Garland. Christy, T.E. (1960). Portrait of a leader: Isabel Hampton Robb. Nursing Outlook, 17:26-9. Dock, L.L. (1912). A history of nursing. Vol 3. NY: GP Putnam. Poslusny, S.M. (1989). Feminist friendship: Isabel Hampton Robb, Lavinia Lloyd Dock and Mary Adelaide Nutting Image: Journal of Nursing Scholarship 21(2): 64-8. Wilson, J.J. (1979). Isabel Hampton and the professionalization of nursing in the 1890's. In: The therapeutic revolution. M.J. Vogel & C.E. Rosenberg, (Eds.). pps. 201-44. Philadelphia: University of Pennsylvania Press.